I love Halloween with all its cute costumes and colorful candy. I really enjoy the traditions we’ve established as a family surrounding this fun holiday, but what I don’t enjoy, is when things start to get too complicated. With classroom parties, last minute costume alterations and the like, things can get chaotic really quickly and it takes a conscious effort on my part to keep things simple. 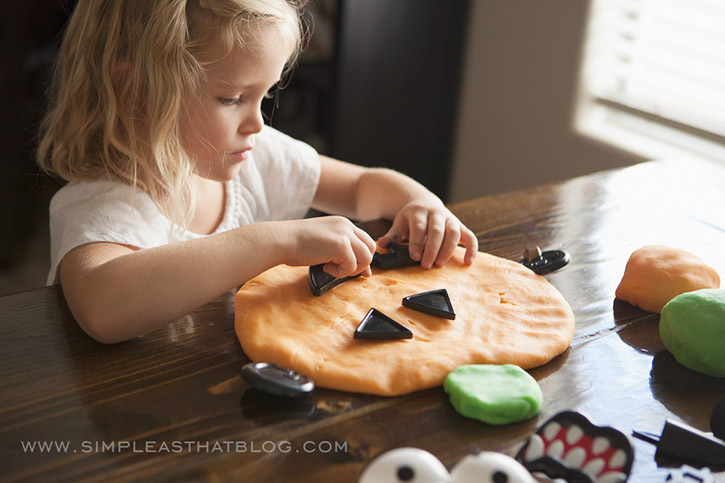 We’ve done some fun crafts and activities as a family leading up to Halloween (I’ll be sharing a few more ideas in another blog post) but I’ve been very careful to keep thing low-key. I truly believe that less is more, especially during the holidays. 2. Used up supplies we already had on hand. 3. Were quick and easy to make. 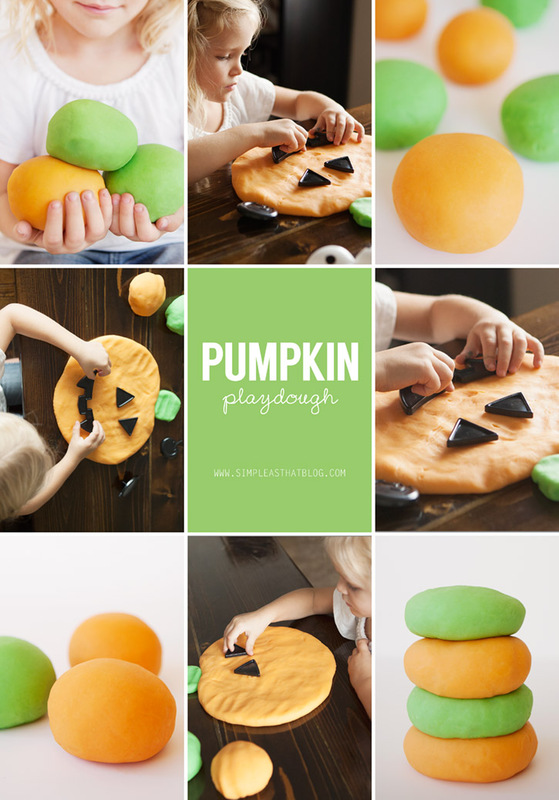 One of my kids favourite activities this year has been playing with this pumpkin playdough. It’s easy to prepare, it didn’t require purchasing a complex list of supplies & I love all the creative, imaginative play that it inspired. We made orange and green playdough using my favorite, fool-proof recipe below. Next, all you need are some items to make your pumpkins faces. We had a plastic silly pumpkin face set from the dollar store, but you could also cut out pieces for the pumpkins face from black craft foam. I used to hate playdough! It’s messy and I hated cleaning it up but my kids love to play with it so much here’s how I’ve learned to embrace it! The day before I mop the floors is playdough day at our house! The kids can get messy with it all they want because the floors are already dirty and I’ll clean them as soon as they’re done and the playdough doesn’t come out again until next mopping day. This keeps me sane and makes playdough a little extra special when t the kids do get to play with it. Mix flour, salt, cream of tartar and Kool-Aid in a medium saucepan. Add water and oil. Stir over medium heat 3-5 minutes. When mixture forms a ball in pan remove. Knead until smooth. Put in plastic bag and refrigerate. What are some of the ways you maintain simplicity at this time of year? I’m eager to hear your thoughts and discuss this in the comments. We’ve also made playdough for fall/halloween! To make it even more festive, we added pumpkin pie spice to the orange dough, and we added cocoa to the other to make it brown and smelling divine! My little boys loved it! where did the pumpkin face pieces come from?